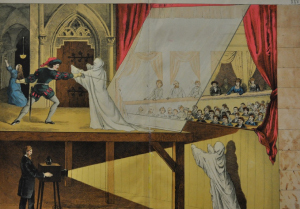 The old effect of “Pepper’s Ghost” has known a revival, now better known as “holographic effect”. It’s used in shows, musicals, presentations, fashion shows (e.g. Madonna, Kate Moss) This was a workshop exploring the possibilities of the effect. This event was open to all, especially for professionals.